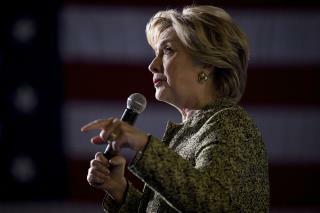 (Newser) – There's more than talk of UFOs in leaked emails from the Hillary Clinton campaign. One shows press secretary Brian Fallon—a former Justice Department official—communicating with the DOJ about the release of Clinton's State Department emails in May 2015. "DOJ folks inform me there is a status hearing in this case this morning, so we could have a window into the judge's thinking about this proposed production schedule as quickly as today," he wrote. Though the DOJ was passing on public information and a federal probe into Clinton's emails hadn't yet begun, the communication still "raises many questions," reports NPR. Donald Trump—battling a firestorm of sexual misconduct allegations—says the emails show Clinton "would be the most dishonest and the most corrupt person ever elected to high office." She can't recall anything or remember anything. Yet she wants to be president. It does't matter what happens with her emails or even if footage surfaces of her using the "N" word. She was declared POTUS several years back. Beyond sad is what has happened to our country. Without a doubt, the greatest country in the world. You will find great people no matter what part of our nation you go to to. You would also be hard pressed to find a more corrupt government. If the government has the technology to listen to every phone call then it stands to reason that they can count every single vote. The electoral college needs to be outlawed. As long as it exists there can never be a government by the people for the people. When the DOJ declined to prosecute Clinton for violating Title 18 of the criminal code, I knew the fix was in. Even a first year law student could make an airtight case, based on the evidence presented. Neither Trump, nor Clinton, is even remotely qualified to hold high office. This political season has devolved into an absurd parody of an election. The only honorable course for a voter to take, is to boycott this election entirely, unless one lives in Nevada, where "none of the above" appears as a ballot choice. I would add one caveat: There is a candidate who, so far as we know, has not violated any law, or breached any ethical or moral standard. Evan McMullin seems intelligent, sane, ethical, and well versed in both foreign and domestic policy issues. Of course, nobody knows about him, because the mainstream media won't give him the time of day.